This article is about the multinational automobile manufacturer. For other uses, see Nissan (disambiguation). Nissan Motor Co., Ltd. (Japanese: 日産自動車株式会社, Hepburn: Nissan Jidōsha Kabushiki-gaisha), usually shortened to Nissan (/ˈniːsɑːn/ or UK: /ˈnɪsæn/; Japanese pronunciation: [ɲissaɴ]), is a Japanese multinational automobile manufacturer headquartered in Nishi-ku, Yokohama. The company sells its cars under the Nissan, Infiniti, and Datsun brands with in-house performance tuning products labelled Nismo. The company traces its name to the Nissan zaibatsu, now called Nissan Group. Since 1999, Nissan has been part of the Renault–Nissan–Mitsubishi Alliance, a partnership between Nissan of Japan, Mitsubishi Motors of Japan and Renault of France. As of 2013, Renault holds a 43.4% voting stake in Nissan, while Nissan holds a 15% non-voting stake in Renault. From 2009 to 2017 Carlos Ghosn served as CEO of both companies. In February 2017 Ghosn announced he would step down as CEO of Nissan on 1 April 2017, while remaining chairman of the company. On 19 November 2018, Ghosn was fired as chairman following his arrest for the alleged underreporting of his income to Japanese financial authorities. After 108 days in detention, Ghosn was released on bail, but after 29 days he was again detained on new charges (4 April 2019). He'd been due to hold a news conference, but instead his lawyers released a video of Ghosn alleging this 2018-2019 Nissan scandal is itself evidence of value destruction and Nissan corporate mismanagement. In 2013, Nissan was the sixth largest automaker in the world, after Toyota, General Motors, Volkswagen Group, Hyundai Motor Group, and Ford. Taken together, the Renault–Nissan Alliance would be the world's fourth largest automaker. Nissan is the leading Japanese brand in China, Russia and Mexico. Nissan is the world's largest electric vehicle (EV) manufacturer, with global sales of more than 320,000 all-electric vehicles as of April 2018. The top-selling vehicle of the car-maker's fully electric lineup is the Nissan LEAF, an all-electric car and the world's top-selling highway-capable plug-in electric car in history. Commercial operations were placed on hold during Japan's participation in World War I, and the company contributed to the war effort. In 1931, DAT came out with a new smaller car, called the Datsun Type 11, the first "Datson", meaning "Son of DAT". Later in 1933 after Nissan Group zaibatsu took control of DAT Motors, the last syllable of Datson was changed to "sun", because "son" also means "loss" ) in Japanese, hence the name "Datsun" (ダットサン, Dattosan). In 1928, Yoshisuke Aikawa (nickname: Gisuke/Guisuke Ayukawa) founded the holding company Nihon Sangyo (日本産業 Japan Industries or Nihon Industries). The name 'Nissan' originated during the 1930s as an abbreviation used on the Tokyo Stock Exchange for Nihon Sangyo. This company was Nissan "Zaibatsu" which included Tobata Casting and Hitachi. At this time Nissan controlled foundries and auto parts businesses, but Aikawa did not enter automobile manufacturing until 1933. The zaibatsu eventually grew to include 74 firms, and became the fourth-largest in Japan during World War II. In 1934, Aikawa separated the expanded automobile parts division of Tobata Casting and incorporated it as a new subsidiary, which he named Nissan Motor Co., Ltd. (日産自動車, Nissan Jidōsha). The shareholders of the new company however were not enthusiastic about the prospects of the automobile in Japan, so Aikawa bought out all the Tobata Casting shareholders (using capital from Nihon Industries) in June 1934. At this time, Nissan Motor effectively became owned by Nihon Sangyo and Hitachi. In 1935, construction of its Yokohama plant was completed. 44 Datsuns were shipped to Asia, Central and South America. 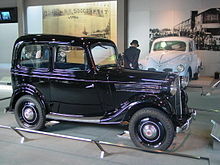 In 1935, the first car manufactured by an integrated assembly system rolled off the line at the Yokohama plant. Nissan built trucks, airplanes, and engines for the Imperial Japanese Army. November 1937 Nissan's headquarter was moved to Hsinking the capital of Manchukuo then in December changed name to Manchuria Heavy Industries Developing Co. In 1940, first knockdown kits were shipped to Dowa Jidosha Kogyo (Dowa Automobile), one of MHID's companies, for assembly. In 1944, the head office was moved to Nihonbashi, Tokyo, and the company name was changed to Nissan Heavy Industries, Ltd., which the company kept through 1949. DAT had inherited Kubota's chief designer, American engineer William R. Gorham. This, along with Aikawa's 1908 visit to Detroit, was to greatly affect Nissan's future. Although it had always been Aikawa's intention to use cutting-edge auto making technology from America, it was Gorham that carried out the plan. Most of the machinery and processes originally came from the United States. When Nissan started to assemble larger vehicles under the "Nissan" brand in 1937, much of the design plans and plant facilities were supplied by the Graham-Paige Company. Nissan also had a Graham license under which passenger cars, buses and trucks were made. In David Halberstam's 1986 book The Reckoning, Halberstam states "In terms of technology, Gorham was the founder of the Nissan Motor Company" and that "young Nissan engineers who had never met him spoke of him as a god and could describe in detail his years at the company and his many inventions." From 1934 Datsun began to build Austin 7s under licence. This operation became the greatest success of Austin's overseas licensing of its Seven and marked the beginning of Datsun's international success. In 1952, Nissan entered into a legal agreement with Austin, for Nissan to assemble 2,000 Austins from imported partially assembled sets and sell them in Japan under the Austin trademark. The agreement called for Nissan to make all Austin parts locally within three years, a goal Nissan met. Nissan produced and marketed Austins for seven years. The agreement also gave Nissan rights to use Austin patents, which Nissan used in developing its own engines for its Datsun line of cars. In 1953, British-built Austins were assembled and sold, but by 1955, the Austin A50 – completely built by Nissan and featuring a new 1489 cc engine—was on the market in Japan. Nissan produced 20,855 Austins from 1953 to 1959. Nissan leveraged the Austin patents to further develop their own modern engine designs past what the Austin's A- and B-family designs offered. The apex of the Austin-derived engines was the new design A series engine in 1966. In 1967, Nissan introduced its new highly advanced four cylinder overhead cam (OHC) Nissan L engine, which while similar to Mercedes-Benz OHC designs was a totally new engine designed by Nissan. This engine powered the new Datsun 510, which gained Nissan respect in the worldwide sedan market. Then, in 1969 Nissan introduced the Datsun 240Z sports car which used a six-cylinder variation of the L series engine, developed under Nissan Machinery (Nissan Koki Co., Ltd. 日産工機) in 1964, a former remnant of another auto manufacturer Kurogane. The 240Z was an immediate sensation and lifted Nissan to world-class status in the automobile market. During the Korean War, Nissan was a major vehicle producer for the U.S. Army. After the Korean War ended, significant levels of anti-communist sentiment existed in Japan. The union that organized Nissan's workforce was strong and militant. Nissan was in financial difficulties, and when wage negotiations came, the company took a hard line. Workers were locked out, and several hundred were fired. The Japanese government and the U.S. occupation forces arrested several union leaders. The union ran out of strike funds, and was defeated. A new labor union was formed, with Shioji Ichiro one of its leaders. Ichiro had studied at Harvard University on a U.S. government scholarship. He advanced an idea to trade wage cuts against saving 2,000 jobs. Ichiro's idea was made part of a new union contract  that prioritized productivity. Between 1955 and 1973, Nissan "expanded rapidly on the basis of technical advances supported – and often suggested – by the union." Ichiro became president of the Confederation of Japan Automobile Workers Unions and "the most influential figure in the right wing of the Japanese labor movement." In 1966, Nissan merged with the Prince Motor Company, bringing more upmarket cars, including the Skyline and Gloria, into its selection. The Prince name was eventually abandoned, and successive Skylines and Glorias bore the Nissan name. "Prince," was used at the Japanese Nissan dealership "Nissan Prince Shop" until 1999, when "Nissan Red Stage" replaced it. Nissan Red Stage itself has been replaced as of 2007. The Skyline lives on as the G Series of Infiniti. To capitalize the renewed investment during 1964 Summer Olympics, Nissan established the gallery on the second and third floors of the San-ai building, located in Ginza, Tokyo. To attract visitors, Nissan started using beautiful female showroom attendants where Nissan held a competition to choose five candidates as the first class of Nissan Miss Fairladys, modeled after "Datsun Demonstrators" from the 1930s who introduced cars. The Fairlady name was used as a link to the popular Broadway play My Fair Lady of the era. Miss Fairladys became the marketers of the Datsun Fairlady 1500. In the 1950s, Nissan decided to expand into worldwide markets. Nissan management realized their Datsun small car line would fill an unmet need in markets such as Australia and the world's largest car market, the United States. They first showed the Datsun Bluebird at the 1958 Los Angeles Auto Show. The company formed a U.S. subsidiary, Nissan Motor Corporation U.S.A., in Gardena, California in 1960, headed by Yutaka Katayama. Nissan continued to improve their sedans with the latest technological advancements and chic Italianate styling in sporty cars such as the Datsun Fairlady roadsters, the race-winning 411 series, the Datsun 510 and the world-class Datsun 240Z. By 1970, Nissan had become one of the world's largest exporters of automobiles. In the wake of the 1973 oil crisis, consumers worldwide (especially in the lucrative U.S. market) began turning to high-quality small economy cars. To meet the growing demand for its new Nissan Sunny, the company built new factories in Mexico (Nissan Mexicana was established in the early 1960s and commenced manufacturing since 1966 at their Cuernavaca assembly facility, making it their first North American assembly plant), Australia, New Zealand, Taiwan, United States (Nissan Motor Manufacturing Corporation USA was established in 1980) and South Africa. The "Chicken Tax" of 1964 placed a 25% tax on commercial vans imported to the United States. In response, Nissan, Toyota Motor Corp. and Honda Motor Co. began building plants in the U.S. in the early 1980s. Nissan's initial assembly plant Smyrna assembly plant (which broke ground in 1980) at first built only trucks such as the 720 and Hardbody, but has since expanded to produce several car and SUV lines, including the Altima, Maxima, Rogue, Pathfinder, Infiniti QX60 and LEAF all-electric car. The addition of mass-market automobiles was in response to the 1981 Voluntary Export Restraints imposed by the U.S. Government. An engine plant in Decherd, Tennessee followed, most recently a second assembly plant was established in Canton, Mississippi. In 1970, Teocar was created, which was a Greek assembly plant created in cooperation with Theoharakis. It was situated in Volos, Greece and its geographical location was perfect as the city had a major port. The plant started production in 1980, assembling Datsun pick-up trucks and continued with the Nissan Cherry & Sunny vehicles. Until May 1995 170,000 vehicles were made, mainly for Greece. By the early 1980s, Nissan (Datsun) had long the best selling Japanese brand in Europe. In order to overcome export tariffs and delivery costs to its European customers, Nissan contemplated establishing a plant in Europe. Nissan tried to convert the Greek plant into one manufacturing cars for all European countries however due to issues with the Greek government not only did that not happen but the plant itself was closed. A joint venture with Italy's then state-owned Alfa Romeo was also entered in 1980, leading to Italian production of the Nissan Cherry and an Alfa-badged version, the Alfa Romeo Arna. After an extensive review, Nissan decided to go it alone instead. The City of Sunderland in the north east of England was chosen for its skilled workforce and its location near major ports. The plant was completed in 1986 as the subsidiary Nissan Motor Manufacturing (UK) Ltd. By 2007, it was producing 400,000 vehicles per year, landing it the title of the most productive plant in Europe. In 2001, Nissan established a manufacturing plant in Brazil. In 2005, Nissan added operations in India, through its subsidiary Nissan Motor India Pvt. Ltd. With its global alliance partner, Renault, Nissan invested $990 million to set up a manufacturing facility in Chennai, catering to the Indian market as well as a base for exports of small cars to Europe. Nissan entered the Middle East market in 1957 when it sold its first car in Saudi Arabia. Nissan sold nearly 520,000 new vehicles in China in 2009 in a joint venture with Dongfeng Motor. To meet increased production targets, Dongfeng-Nissan expanded its production base in Guangzhou, which would become Nissan's largest factory around the globe in terms of production capacity. Nissan also has moved and expanded its Nissan Americas Inc. headquarters, moving from Los Angeles to Franklin, Tennessee in the Nashville area. In the U.S., Nissan has been increasing its reliance on sales to daily-rental companies like Enterprise Rent-A-Car or Hertz. In 2016, Nissan's rental sales jumped 37% and in 2017 Nissan became the only major auto maker to boost rental sales when the Detroit Three cut back less profitable deliveries to daily-rental companies, which traditionally are the biggest customers of domestic auto makers. In Australia, between 1989 and 1992, Nissan Australia shared models with Ford Australia under a government-backed rationalisation scheme known as the Button Plan, with a version of the Nissan Pintara being sold as the Ford Corsair and a version of the Ford Falcon as the Nissan Ute. A variant of the Nissan Patrol was sold as the Ford Maverick during the 1988–94 model years. In North America, Nissan partnered with Ford from 1993 to 2002 to market the Ohio built Mercury Villager and the Nissan Quest. The two minivans were virtually identical aside from cosmetic differences. In 2002, Nissan and Ford announced the discontinuation of the arrangement. In Europe, Nissan and Ford Europe partnered to produce the Nissan Terrano II and the badge engineered Ford Maverick, a mid-size SUV produced at the Nissan Motor Ibérica S.A (NMISA) plant in Barcelona, Spain. The Maverick/Terrano II was a popular vehicle sold throughout Europe and Australasia. It was also sold in Japan as a captive import, with the Nissan model marketed as the Nissan Mistral. Nissan licensed the Volkswagen Santana. Production began in 1984, at Nissan's Zama, Kanagawa, and ended in May 1990. In 2013, GM announced its intentions to rebadge the Nissan NV200 commercial van as the 2015 model year Chevrolet City Express, to be introduced by end of 2014. Holden, GM's Australian subsidiary, sold versions of the Nissan Pulsar as the Holden Astra between 1984 and 1989. LDV Group sold a badge engineered light commercial vehicle version of the Nissan Serena as the LDV Cub from 1996 to 2001. The Nissan equivalent was marketed as the Nissan Vannette Cargo. In 1999, facing severe financial difficulties, Nissan entered an alliance with Renault S.A. of France. Signed on 27 March 1999, the Renault-Nissan Alliance was the first of its kind involving a Japanese and French car manufacturer, each with its own distinct corporate culture and brand identity. In the spring of 2000, Yanase, Japan's premier seller of imported automobiles, cancelled its licensing contract with Renault, and Nissan took over as the sole licensee. In June 2001, Carlos Ghosn was named chief executive officer of Nissan. In May 2005, Ghosn was named president of Renault. He was appointed president and CEO of Renault on 6 May 2009. Nissan's management is a trans-cultural, diverse team. Under CEO Ghosn's "Nissan Revival Plan" (NRP), the company has rebounded in what many leading economists consider to be one of the most spectacular corporate turnarounds in history, catapulting Nissan to record profits and a dramatic revitalization of both its Nissan and Infiniti model line-ups. Ghosn has been recognized in Japan for the company's turnaround in the midst of an ailing Japanese economy. Ghosn and the Nissan turnaround were featured in Japanese manga and popular culture. His achievements in revitalizing Nissan were noted by the Japanese Government, which awarded him the Japan Medal with Blue Ribbon in 2004. On 7 April 2010, Daimler AG exchanged a 3.9% share of its holdings for 3.9% from both Nissan and Renault. This triple alliance allows for the increased sharing of technology and development costs, encouraging global cooperation and mutual development. In 2003, Nissan and Dongfeng Motor Group formed a 50:50 joint venture with the name Dongfeng Motor Co., Ltd. (DFL). The company calls itself "China's first automotive joint venture enterprise with a complete series of trucks, buses, light commercial vehicles and passenger vehicles," and "the largest joint-venture project of its scale." On 7 April 2010, Daimler AG exchanged a 3.1% share of its holdings for 3.1% from both Nissan and Renault. This triple alliance allows for the increased sharing of technology and development costs, encouraging global cooperation and mutual development. On 12 December 2012, the Renault–Nissan Alliance formed a joint venture with Russian Technologies (Alliance Rostec Auto BV) with the aim of becoming the long-term controlling shareholder of AvtoVAZ, Russia's largest car company and owner of the country's biggest selling brand, Lada. Carlos Ghosn was appointed chairman of the board of AvtoVAZ on 27 June 2013. Nissan exited the AvtoVAZ venture in September 2017. Nissan is in an alliance with Ashok Leyland in India, producing light commercial vehicles. Together with Mitsubishi Motors, Nissan develops mini cars which are produced at Mitsubishi's Mizushima plant in Kurashiki, Okayama, Japan. In May 2016 Nissan bought a controlling stake in Mitsubishi Motors for an estimated US$2.3 billion. 2001–2017: Carlos Ghosn - CEO until 1 April 2017. Remained chairman until removed from role on 19 November 2018 after arrest. Infiniti: Since 1989, Nissan has sold its luxury models under the Infiniti brand. 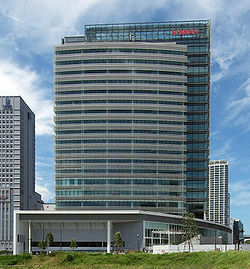 In 2012, Infiniti changed its headquarters to Hong Kong, where it is incorporated as Infiniti Global Limited. Its president is former BMW executive Roland Krueger. From 2014, Infiniti cars are sold in Japan. It also produced several memorable sports cars, including the Datsun Fairlady 1500, 1600 and 2000 Roadsters, the Z-car, an affordable sports car originally introduced in 1969; and the GT-R, a powerful all-wheel-drive sports coupe. Nissan also sells a range of kei cars, mainly as a joint venture with other Japanese manufacturers like Suzuki or Mitsubishi. Until 2013, Nissan rebadged kei cars built by other manufacturers. Beginning in 2013, Nissan and Mitsubishi shared the development of the Nissan DAYZ / Mitsubishi eK Wagon series. Nissan also has shared model development of Japanese domestic cars with other manufacturers, particularly Mazda, Subaru, Suzuki and Isuzu. In China, Nissan produces cars in association with the Dongfeng Motor Group including the 2006 Nissan Livina Geniss, the first in a range of a new worldwide family of medium-sized car. In 2011, after Nissan released the Nissan NV-Series in the United States, Canada, and Mexico, Nissan created a commercial sub brand called Nissan Commercial Vehicles which focuses on commercial vans, pickup trucks, and fleet vehicles for the US, Canadian, and Mexican Markets. Nissan launched their Nissan Intelligent Mobility vision in 2016 by revealing the IDS Concept at the 2016 Geneva Motor Show. Most Nissan vehicles like the Dayz, Rogue and Leaf are equipped with Nissan Intelligent Mobility technology. In 2018, Nissan launched the sixth-generation Altima at the 2018 New York Auto Show. Nissan Red Stage was the result of combining an older sales channel of dealerships under the names "Nissan Prince Store" (ja:日産・プリンス店, Nissan Purinsu-ten), established in 1966 after the merger of Prince Motors by Nissan, which sold the Nissan Skyline, and "Nissan Satio Store" (日産・サティオ店, Nissan Satio-ten), which sold cars developed from the Nissan Sunny at its introduction in 1966. The word "satio" is Latin, which means ample or sufficient. "Nissan Cherry Store" (日産・チェリー店, Nissan Cherī-ten) was briefly known previously as "Nissan Cony Store" when they assumed operations of a small kei manufacturer called Aichi Machine Industry Co., Ltd. (愛知機械工業) who manufactured the "Cony", "Guppy" and "Giant" brand of kei cars and trucks until 1970, when the network was renamed for the Nissan Cherry. Nissan Blue Stage was the result of combining older sales channels, called "Nissan Store" (ja:日産店, Nissan Mise) in 1955, then renamed "Nissan Bluebird Store" in 1966, selling Nissan's original post-war products called the Datsun Bluebird, Datsun Sports, Datsun Truck, Datsun Cablight, Datsun Cabstar, Nissan Junior, and Nissan Cedric. "Nissan Motor Store" (日産・モーター店, Nissan Mōtā-ten) was established in 1965, and offered luxury sedans like the Nissan Laurel and the Nissan President. In 1970, Nissan also set up a separate sales chain which sold used cars including auctions, called Nissan U-Cars (ja:日産ユーズドカーセンター, Nissan Yūzudo Kā Sentā), which they still maintain. In the early days of Nissan's dealership network, Japanese consumers were directed towards specific Nissan stores for cars that were of a specific size and pricepoint. Over time as sales progressed and the Japanese automotive industry became more prolific, vehicles that were dedicated to particular stores were badge engineered, given different names, and shared within the existing networks thereby selling the same platforms at different locations. The networks allowed Nissan to better compete with the network established earlier by Toyota at Japanese locations. Starting in 1960, another sales distribution channel was established that sold diesel products for commercial use, called Nissan Diesel until the diesel division was sold in 2007 to Volvo AB. To encourage retail sales, Nissan passenger vehicles that were installed with diesel engines, like the Cedric, were available at Nissan Diesel locations. The Nissan Titan was introduced in 2004, as a full-size pickup truck produced for the North American market, the truck shares the stretched Nissan F-Alpha platform with the Nissan Armada and Infiniti QX56 SUVs. It was listed by Edmunds.com as the best full-size truck. The second generation Titan was revealed at the 2016 North American International Auto Show as a 2017 model year vehicle. The Atlas F22 was sold in Europe as the Nissan Cabstar and proved a popular truck in the UK market due to its reliability and ability to carry weight. From 1990 the range widened and was sold as the Cabstar E. Actually (2015) the Cabstar is manufactured in the NSIO (Nissan Spanish Industrial Operations) Plant in Ávila, Spain under the brand name of NT400. Nissan introduced its first battery electric vehicle, the Nissan Altra at the Los Angeles International Auto Show on 29 December 1997. Unveiled in 2009, the EV-11 prototype electric car was based on the Nissan Tiida (Versa in North America), with the conventional gasoline engine replaced with an all-electric drivetrain. In 2010, Nissan introduced the Nissan LEAF as the first mass-market, all-electric vehicle launched globally. As of March 2014[update], the Nissan Leaf was the world's best selling highway-capable all-electric car ever. Global sales totaled 100,000 Leafs by mid January 2014, representing a 45% market share of worldwide pure electric vehicles sold since 2010. Global Leaf sales passed the 200,000 unit milestone in December 2015, and the Leaf continued ranking as the all-time best selling all-electric car. Nissan's second all-electric vehicle, the Nissan e-NV200, was announced in November 2013. Series production at the Nissan Plan in Barcelona, Spain, began on 7 May 2014. The e-NV200 commercial van is based on the Nissan Leaf. Nissan plans to launch two additional battery electric vehicles by March 2017. In June 2016, Nissan announced it will introduce its first range extender car in Japan before March 2017. The series plug-in hybrid will use a new hybrid system, dubbed e-Power, which debuted with the Nissan Gripz concept crossover showcased at the September 2015 Frankfurt Auto Show. As of August 2016[update], Nissan electric vehicles were sold in 48 world markets. Nissan global electric vehicle sales passed 275,000 units in December 2016. 2018 Nissan Leaf at an electric charging station. Nissan autonomous car prototype technology was fitted on a Nissan Leaf all-electric car. In August 2013 Nissan announced its plans to launch several driverless cars by 2020. The company is building a dedicated autonomous driving proving ground in Japan, to be completed in 2014. Nissan installed its autonomous car technology in a Nissan Leaf all-electric car for demonstration purposes. The car was demonstrated at Nissan 360 test drive event held in California in August 2013. In September 2013, the Leaf fitted with the prototype Advanced Driver Assistance System was granted a license plate that allows it to drive on Japanese public roads. The testing car will be used by Nissan engineers to evaluate how its in-house autonomous driving software performs in the real world. Time spent on public roads will help refine the car's software for fully automated driving. The autonomous Leaf was demonstrated on public roads for the first time at a media event held in Japan in November 2013. The Leaf drove on the Sagami Expressway in Kanagawa prefecture, near Tokyo. Nissan vice chairman Toshiyuki Shiga and the prefecture's governor, Yuji Kuroiwa, rode in the car during the test. Nissan has also had a number of ventures outside the automotive industry, most notably the Tu–Ka mobile phone service (est. 1994), which was sold to DDI and Japan Telecom (both now merged into KDDI) in 1999. Nissan offers a subscription-based telematics service in select vehicles to drivers in Japan, called CarWings. Nissan also owns Nissan Marine, a joint venture with Tohatsu Corp that produces motors for smaller boats and other maritime equipment. Nismo is the motorsports division of Nissan, founded in 1984. Nismo cars have participated in the All Japan Sports Prototype Championship, Super GT, IMSA GT Championship, World Sportscar Championship, FIA World Endurance Championship, British Touring Car Championship, Supercars Championship and Blancpain GT Series. Also, they were featured at the World Series by Nissan from 1998 to 2004. Nissan sponsored the Los Angeles Open golf tournament from 1987 to 2007. Beginning in 2015, Nissan became the naming rights sponsor for Nissan Stadium, the home of the Tennessee Titans and Tennessee State University football teams in Nashville. Nissan also became the official sponsor of the Heisman Trophy and UEFA Champions League. Nissan's central research  is inside the Oppama Plant site, Yokosuka, which began its operation in 1961, at the former site of Imperial Japanese Navy's Airborn Squadron base. In 1982, Nissan's technical centers in Suginami, Tokyo and Tsurumi, Yokohama were combined into one: Nissan Technical Center (NTC) in Atsugi, Kanagawa, at the foot of Mount Ōyama of the Tanzawa Mountains. At its 30th anniversary in 2012, NTC employed 9,500 employees in product development, design, production engineering and purchasing. Nissan Technical Center works closely with its overseas operations: Nissan Technical Center (NTC)/North America, NTC/Mexico, Nissan Design America, and Nissan Silicon Valley Office. ^ a b "Brief History of Nissan Motor Company". Brief History of Nissan Motor Company. Archived from the original on 9 May 2017. Retrieved 6 April 2017. ^ a b "History of Nissan Motors". National Science Museum of Japan. National Museum of Nature and Science, Tokyo. Retrieved 6 April 2017. ^ a b "Masujiro Hashimoto". Japan Automobile Hall of Fame. Archived from the original on 3 September 2009. Retrieved 6 April 2017. ^ "Nissan Production, Sales and Export Results for December 2016 and Calendar Year 2016". Nissan. 30 January 2017. Retrieved 4 March 2017. ^ a b c d e "FY2014 Consolidated Financial Results" (PDF). Nissan. 13 May 2015. Retrieved 13 May 2015. ^ "Outline of company". June 2013. Retrieved 28 January 2013. ^ "Carlos Ghosn, Executive Who Revived Nissan, Will Step Aside". The New York Times. 22 February 2017. Retrieved 13 March 2017. ^ Kiley, David. "Legendary CEO Carlos Ghosn Arrested, Forced Out Of Nissan". Forbes. Retrieved 19 November 2018. ^ "Carlos Ghosn's Video Message". Nikkei Asian Review. Retrieved 12 April 2019. ^ "World Motor Vehicle Production – OICA correspondents survey – World Ranking of Manufacturers – Year 2013" (PDF). OICA. 2014. Retrieved 29 January 2015. ^ a b c "Message from CEO". Nissan. Retrieved 29 January 2014. ^ "Who makes the most cars in North America? Who has the largest auto factory in the U.S.? Don't be embarrassed, few get it right - DailyKanban". 27 February 2015. ^ a b "Strong Nissan LEAF sales drive global EV momentum" (Press release). Nissan. 23 April 2018. Retrieved 2 October 2018. ^ Frost, Laurence; Tajitsu, Naomi (17 January 2018). "Nissan's Infiniti vehicles to go electric". Reuters. US. Retrieved 10 June 2018. ^ a b c d e f g "NISSAN | CORPORATE INFORMATION | Outline of Company|Company Development, Heritage | First half of the history of Nissan". Nissan-global.com. Retrieved 25 November 2011. ^ "Manchurian Industrial Development: Companies and the Development of Manchuria under Occupation". EBHA-BHSJ Paris 20012. 2012. Retrieved 15 September 2013. ^ Tetsuji Okazaki University of Tokyo (August 2013). "Development and Management of Manchurian Economy under the Japan Empire; find 'Manchuria Heavy Industries Developing Co' ; from google (Manchurian Industrial Development: Companies and the Development of Manchuria under Occupation) result 1" (PDF). ^ a b "A Brief History of Nissan Motor Company". Nissan corporate website. Archived from the original on 9 May 2017. ^ "The Short History of Nissan Motor Company". Nissan-global.com. Archived from the original on 2 August 2013. Retrieved 25 February 2014. ^ "1970 Datsun 240Z – Motor Trend All Pages". Motortrend.com. Retrieved 25 February 2014. ^ a b c d Shorrock, Tim (October 1983). "Nissan: Portrait of a Global Giant, A first-hand account of Nissan's robot-dominated factory and the union that helped make Nissan the world's third largest automaker". The Multinational Monitor. 4 (10). Retrieved 20 July 2014. ^ "A brief history of Nissan Motor Company". Nissan. Archived from the original on 11 January 2015. Retrieved 3 August 2014. ^ a b Lohr, Steve (13 February 1982). "Japanese Earned Labor Harmony". New York Times. Retrieved 3 August 2014. ^ "Nissan recalls the birth of Miss Fairlady". Autoblog.com. Retrieved 10 August 2013. ^ "Fair Lady: Nissan's beautiful showroom models". Vehiclepassion.com. 9 August 2012. Retrieved 10 August 2013. ^ "The Birth of Miss Fairlady". Reports.nissan-global.com. Retrieved 10 August 2013. ^ "2008年度日産ミスフェアレディ 新体制発表". Nissan-global.com (in Japanese). 30 May 2008. Archived from the original on 2 November 2013. Retrieved 10 August 2013. ^ "2012年度日産ミスフェアレディ 新体制発表". Nissan-global.com (in Japanese). 21 May 2012. Archived from the original on 10 March 2013. Retrieved 10 August 2013. ^ "2013年度日産ミスフェアレディ 新体制発表". Nissan-global.com (in Japanese). 29 May 2013. Archived from the original on 2 November 2013. Retrieved 10 August 2013. ^ "(datsunstory 5)". Datsunhistory.com. Retrieved 25 February 2014. ^ "Major Offices and Facilities <North America>" (PDF). Nissan USA. 31 March 2002. Archived from the original (PDF) on 2 February 2017. Retrieved 30 October 2016. ^ a b "To Outfox the Chicken Tax, Ford Strips Its Own Vans". The Wall Street Journal, Matthew Dolan, 22 September 2009. 23 September 2009. ^ Donas, Dimitris (28 July 2014). "ΤΕΟΚΑΡ: Όταν οι Ιάπωνες "υποκλίνονταν" στην Ελλάδα" [TEOKAR: When the Japanese "kowtowed" to Greece] (in Greek). news247.gr. Archived from the original on 22 January 2019. ^ a b "Alfa Venture". The Age. 22 September 1980. p. 17. Retrieved 19 August 2012. ^ "Nissan – Corporate Information". Nissan.in. Archived from the original on 29 August 2012. Retrieved 4 December 2009. ^ "Nissan | The Renault-Nissan Alliance Inaugurates Plant In Chennai, India". Nissan-global.com. 17 March 2010. Archived from the original on 2 November 2013. Retrieved 25 February 2014. ^ "Nissan launches 2 new cars in India- Automobiles-Auto-News By Industry-News-The Economic Times". Economictimes.indiatimes.com. 16 September 2009. Retrieved 4 December 2009. ^ "Nissan in ME". Nissan Middle East. ^ "Nissan's Second Guangzhou Factory Breaks Ground". ChinaAutoWeb.com. Retrieved 21 May 2010. ^ "Nissan Corporate Info". Nissan USA. Retrieved 10 April 2016. ^ Colias, Mike; Roberts, Adrienne (3 July 2017). "U.S. Auto Sales Fall as Fewer Vehicles Go to Rental Chains". The Wall Street Journal. Retrieved 5 July 2017. ^ CENS. "Yulon to Produce Own Line of Luxgens in Philippines". CENS. ^ Britannica Book of the Year. 33. Britannica. 1990. p. 229. ISBN 9780852295229. ^ Kiley, David (6 June 2000). "Ford, Nissan to stop minivan production". USA Today. Retrieved 25 February 2014. ^ "Internationalization Strategies. Japan's Auto Industry. About JAMA". Jama.org. Archived from the original on 16 May 2010. Retrieved 3 July 2010. ^ "NISSAN | CORPORATE INFORMATION | Outline of Company|Company Development, Heritage | 1980's". Nissan-global.com. Retrieved 3 July 2010. ^ "Car Life: Nissan: VW Santana". Goo-net. Retrieved 6 July 2010. ^ "Now it's Nissan-Alfa in Italy". Ottawa Citizen. Associated Press. 22 September 1980. Retrieved 19 August 2012. ^ "GM to rebadge Nissan's small commercial vans for Chevy". 14 May 2013. Retrieved 26 June 2014. ^ Dowling, Joshua (12 September 2013). "Holden factory should be sold to China: expert". Carsguide. Retrieved 22 July 2014. ^ "Alliance with Renault". Nissan Global. Archived from the original on 31 December 2007. ^ "Carlos Ghosn, Chairman and Chief Executive Office". Renault. Retrieved 26 January 2014. ^ "The transcultural leader: Carlos Ghosn, CEO of Renault, Nissan 9". INSEAD. 26 May 2008. Retrieved 26 January 2014. ^ "Structure of the Alliance". Nissan Global. Retrieved 8 October 2013. ^ "The Renault Nissan Case Study". Scribd. Retrieved 8 October 2013. ^ a b "Daimler, Nissan and Renault announce three-way tie-up". BBC News. 7 April 2010. Retrieved 20 May 2010. ^ a b "Renault-Nissan and Russian Technologies Create Joint Venture to Finalize Strategic Partnership with Avtovaz" (Press release). Renault-Nissan Alliance. 12 December 2012. Archived from the original on 23 October 2013. Retrieved 27 January 2014. ^ "Renault-Nissan completes deal to take control of AvtoVAZ". Automotive News Europe. 27 June 2014. Retrieved 1 July 2014. ^ "DCarlos Ghosn becomes Chairman of AVTOVAZ Board of Directors" (Press release). Renault. 27 June 2013. Retrieved 27 January 2014. ^ "RENAULT-NISSAN ALLIANCE POSTS RECORD SALES IN 2013 FOR 5TH STRAIGHT YEAR". Renault Nissan Alliance. Archived from the original on 22 February 2014. Retrieved 7 February 2014. ^ "RENAULT-NISSAN ALLIANCE POSTS RECORD SALES IN 2013 FOR 5TH STRAIGHT YEAR". Renault Nissan Alliance. Retrieved 8 February 2014. Note: There is a small conflict in these sources. media.blog.alliance-renault-nissan.com says: "The Renault-Nissan Alliance sold a record 8,264,821 vehicles," whereas http://media.renault.com says: "The Renault-Nissan Alliance sold a record 8,266,098 vehicles..." This edit picks the second source. ^ a b "The giant in hiding". Dailykanban.com. 7 February 2014. Retrieved 7 February 2014. ^ "Carlos Ghosn becomes Chairman of AVTOVAZ Board of Directors" (Press release). Renault. 27 June 2013. Retrieved 27 January 2014. ^ "Nissan перестал быть акционером «АвтоВАЗа»". Vedomosti (in Russian). 19 September 2017. Retrieved 29 November 2017. ^ a b "TTAC Busts Embargo Of Two Unobtainable Cars On The Same Day". Thetruthaboutcars.com. 20 May 2013. Retrieved 29 January 2014. ^ "Nissan Chair Carlos Ghosn Arrested, Dismissed From Job Over Misconduct Allegations". HuffPost. Canada. 19 November 2018. Retrieved 31 December 2018. ^ "Nissan's Carlos Ghosn Steps Down; Hiroto Saikawa Named New CEO". Fox Business. 22 February 2017. Archived from the original on 28 February 2017. Retrieved 27 February 2017. ^ "Nissan on the GO with Datsun". The Hindu. Chennai, India. 15 July 2013. Retrieved 15 September 2013. ^ Mishra, Ashish K (8 July 2013). "Nissan's Indian Gamble with Datsun". Forbes. Retrieved 15 September 2013. ^ Kubota, Yoko (11 November 2013). "Japan's Nissan brings luxury Infiniti badge home". Reuters. Retrieved 29 January 2014. ^ "Nissan Juke NISMO Concept Car and Driver'". Car and Driver'. November 2011. Retrieved 29 January 2014. ^ "TTAC Brings You The NISMO Pictures Jalopnik Misses So Badly". Thetruthaboutcars.com. 26 February 2013. Retrieved 29 January 2014. ^ "Nissan branding". Pushdesign. Archived from the original on 16 December 2013. Retrieved 16 December 2013. ^ "Nissan debuts new corporate logo". Automotive News. 10 May 2013. Retrieved 16 December 2013. ^ "News Releases". Archived from the original on 16 April 2014. Retrieved 20 June 2014. ^ "History of Nissan Commercial Vehicles". USA: Nissan Commercial Vehicles. Retrieved 5 April 2013. ^ "Nissan Brings Back the Datsun Brand". Retrieved 25 November 2018. ^ "Nissan announces 'Nissan Intelligent Mobility' vision, building on company leadership in electrification, vehicle intelligence". Nissan News. Retrieved 25 November 2018. ^ Ulrich, Lawrence. "The 2018 New York Auto Show Actually Made Us Give a Damn About Car Shows". The Drive. Retrieved 25 November 2018. ^ "Beginnings". Kei Car Fanzine. Kei Car Fanzine. Archived from the original on 5 January 2017. Retrieved 4 January 2017. ^ "Premium Factory" (in Japanese). Japan: Nissan. Retrieved 15 February 2014. ^ "Edmunds.com's Most Significant Vehicles, 1966–2006". Edmunds.com. Retrieved 18 October 2010. ^ "Nissan Titan model history". Nadaguides.com. Retrieved 20 September 2013. ^ "All-New Nissan Altra EV: A Friendly, High-Tech Electric Vehicle for Everyday Life". The Auto Channel. 29 December 1997. Retrieved 23 December 2010. ^ "Nissan shows test models of electric car, hybrid". MSNBC News. Associated Press. 6 August 2008. Retrieved 25 April 2010. ^ "Nissan Leaf EV ready for certified pre-owned program". Autoblog Green. 13 September 2013. Retrieved 20 September 2013. ^ a b Nissan News Release (5 March 2014). "Nissan LEAF global sales reach 100,000 units". Automotive World. Retrieved 20 January 2014. ^ Guinness World Records (2012). "Best-selling electric car". Guinness World Records. Archived from the original on 16 February 2013. Retrieved 22 January 2013. ^ Cobb, Jeff (8 December 2015). "Nissan Sells 200,000th Leaf Just Before Its Fifth Anniversary". Hybrid Cars. Retrieved 11 December 2015. See editorial note. ^ "Power to the people: Nissan and ENEL launch first smart grid trials" (Press release). Paris: Nissan Europe. 8 December 2015. Retrieved 11 December 2015. More than 200,000 Nissan Leafs have been sold worldwide. ^ "Nissan to Introduce the 100% Electric Commercial Vehicle 'e-NV200' in Japan during FY2014". Nissan. 14 November 2013. Archived from the original on 26 December 2014. Retrieved 27 November 2014. ^ "Nissan e-NV200 Production Begins in Spain". Nissan. 7 May 2014. Retrieved 27 November 2014. ^ Yoko Kubota and Maki Shiraki (9 June 2014). "Nissan launches second electric vehicle, stands by zero-emission technology". Reuters. Retrieved 9 June 2014. ^ Greimel, Hans (25 June 2016). "Nissan's to-do list: Range, autonomy". Automotive News. Retrieved 27 June 2016. ^ "Renault-Nissan Alliance hits milestone of 350,000 electric vehicles sold, maintains position as global EV leader" (Press release). Paris/Yokohama: Renault-Nissan Alliance. 13 September 2016. Retrieved 4 September 2016. ^ Nissan News (28 August 2013). "Nissan says it will have first commercially-viable autonomous drive vehicles by 2020; across the range in 2 vehicle generations". Green Car Congress. Retrieved 5 March 2014. ^ Paul Stenquist (29 August 2013). "Nissan Announces Plans to Release Driverless Cars by 2020". The New York Times. Retrieved 5 March 2014. ^ Nikki Gordon-Bloomfield (26 September 2013). "Nissan's Autonomous LEAF Granted License for Public Roads in Japan". PluginCars.com. Retrieved 5 March 2014. ^ Jonathan Welsh (2 December 2013). "Self-Driving Nissan Electric Car Takes to Highway". The Wall Street Journal. Retrieved 5 March 2014. ^ Alexis Santos (26 November 2013). "Nissan Leaf prototype becomes first autonomous car to hit Japanese highways (video)". Engadget.com. Retrieved 5 March 2014. ^ "Introduction to Rocket Science and Engineering". google.co.uk. Retrieved 10 April 2016. ^ Wyatt, Jim (25 June 2015). "Titans' stadium LP Field to be renamed Nissan Stadium". The Tennessean. Retrieved 25 June 2015. ^ "Champions League: Uefa signs Nissan as new sponsor". BBC News. Retrieved 14 September 2014. ^ "Nissan Production, Sales and Export Results for Calendar Year 2010" (Press release). Nissan. 26 January 2011. Retrieved 3 February 2011. ^ "Nissan Production, Sales and Export Results for Calendar Year 2011" (Press release). Nissan. 29 January 2012. Archived from the original on 23 February 2012. Retrieved 3 February 2012. ^ "Nissan Production, Sales and Export Results for Calendar Year 2012" (Press release). Nissan. 29 January 2013. Archived from the original on 23 April 2013. Retrieved 3 February 2013. ^ "Nissan Production, Sales and Export Results for Calendar Year 2013" (Press release). Nissan. 29 January 2014. Archived from the original on 19 February 2014. Retrieved 3 February 2014. ^ "Nissan Production, Sales and Export Results for December 2014 and Calendar Year 2014" (Press release). Nissan. 27 January 2015. Retrieved 28 November 2018. ^ "Nissan Production, Sales and Export Results for December 2015 and Calendar Year 2015" (Press release). Nissan. 27 January 2016. Retrieved 28 November 2018. ^ "Nissan production, sales and export results for December 2016 and calendar year 2016" (Press release). Nissan. 29 January 2017. Retrieved 28 November 2018. ^ "Nissan Production, Sales and Export Results for December 2017 and Calendar Year 2017" (Press release). Nissan. 29 January 2018. Retrieved 28 November 2018. ^ "Nissan Facilities Overseas". Retrieved 19 December 2013. ^ "Nissan Decides to Establish New Company Based on its Kyushu Plant". Archived from the original on 6 June 2011. Retrieved 28 May 2012. ^ "NISSAN SHATAI : Company History(1990–2009)". Retrieved 16 April 2010. ^ "Aichi Machine Industry". Archived from the original on 1 June 2002. Retrieved 1 December 2007. ^ 日産村山工場跡地 [Site of former Nissan factory] (in Japanese). Japan: City of Musashimurayama. 16 April 2010. Archived from the original on 16 July 2015. Retrieved 22 July 2015. ^ "earlydatsun.com". earlydatsun.com. Archived from the original on 4 March 2016. Retrieved 10 April 2016. ^ "Closer Ties to the Customer" (PDF). Nissan. 2003. ^ "Infiniti models to be manufactured in XiangYang, China beginning 2014" (Press release). Nissan. 28 May 2012. Archived from the original on 4 March 2016. Retrieved 29 December 2014. ^ "DongFeng Nissan Dalian plant commences production" (Press release). Nissan. 18 October 2014. Archived from the original on 29 December 2014. Retrieved 29 December 2014. ^ Ohnsman, Alan (6 October 2011). "Nissan Plans $1.4 Billion Plant in Brazil to Boost Sales". Bloomberg. Retrieved 10 August 2013. Wikimedia Commons has media related to Nissan dealerships.